Police are hunting for a "Middle Eastern-looking man" who was filmed by a closed circuit TV camera, and say they are "more than 50% certain" he is the bomber. 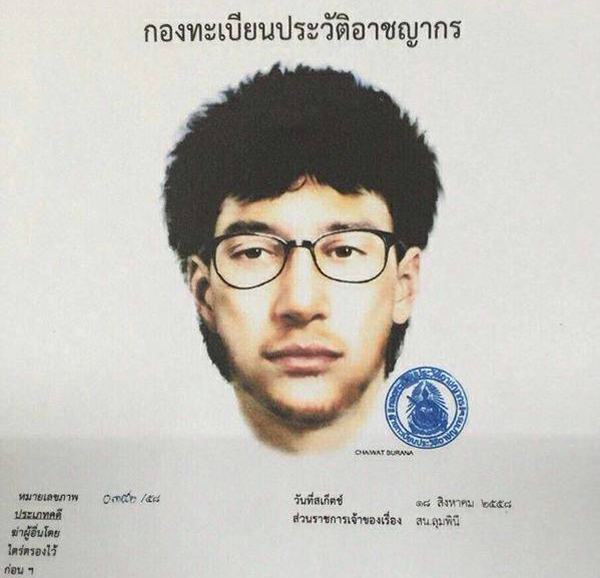 The young, slightly built man wearing a yellow T-shirt and black-framed glasses, was carrying a backpack. In the surveillance video he wanders around the shrine, and is seen sitting down and putting down backpack. Since Monday night's bombing the Royal Thai Police have been on high alert. There was a suspicous looking package left below BTS Nana Station. Eventually, it turned out to be a hoax. After opening the box, nothing was inside. Just a box with plastic wrapping on the outside. Police are right to be suspicous after Monday's bombing. Let's hope peace is restored in Bangkok as soon as possible. link:http://www.bangkokpt.com/news/security/661460/b1m-bounty-on-erawan-bomber-head. View our policies at http://goo.gl/9HgTd and http://goo.gl/ou6Ip. © Post Publishing PCL. All rights reserved.